The Motorola DS3578 Series of rugged, cordless digital scanners bring comprehensive, high performance data capture to harsh industrial environments to improve business efficiency. Engineered with breakthrough digital imaging technology, this scanner family delivers extremely fast and accurate data capture of one-dimensional (1D) and two-dimensional (2D) bar codes, and direct part marks (DPM) as well as Item Unique Identification (IUID)* support. Available in three models, the DS3578 Series of scanners can meet a wide variety of data capture needs in multiple industries. Integrated Bluetooth eliminates the cord between the scanner and the host, enabling employees to move freely throughout the work environment. Productivity, efficiency and even worker safety can be improved. Plus, the elimination of the cord reduces downtime from cable breakdowns — a common point of failure in handheld devices used in industrial environments. With the DS3578 Series, you benefit from a scanning solution designed specifically for fastpaced production environments. The CMOS image sensors allow the accurate capture and processing of bar codes at a faster pace than the typical digital scanner. The DS3578 Series is armed with a powerful 624 MHz microprocessor, capable of decoding 1D or 2D bar codes within milliseconds, regardless of size or density, and the patent pending fast-pulse illumination and fast sensor shutter speed deliver outstanding motion tolerance. In addition, the omni-directional scanning functionality allows operators to quickly capture bar codes from any angle, eliminating the need to align bar codes with laser lines. 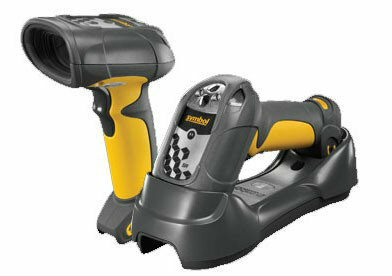 Plus, the DS3578 Series offers the widest working range of any scanner in its class.